You must prove residency in Missouri at the time required for the type of certificate desired, or Civil War service, whichever applies. You must prove the relationship between each generation, beginning with yourself and ending with the ancestor who is the focus of your application. Complete all applicable forms for the type of certificate for which you are applying and prepare one set of supporting documents. (Save a copy for your records.) Please sign and date each page of the application. You will receive an email or postal mail notification that your application has been received. You will be notified if any corrections or additional information is needed. Certificates will be mailed upon final approval. Certificate holders may be announced in the MoSGA newsletter, “SHOW ME” STATE Genealogical News, and may be given recognition at the next MoSGA annual conference following acceptance. Names and dates of Missouri First Families will be posted on the MoSGA Website. 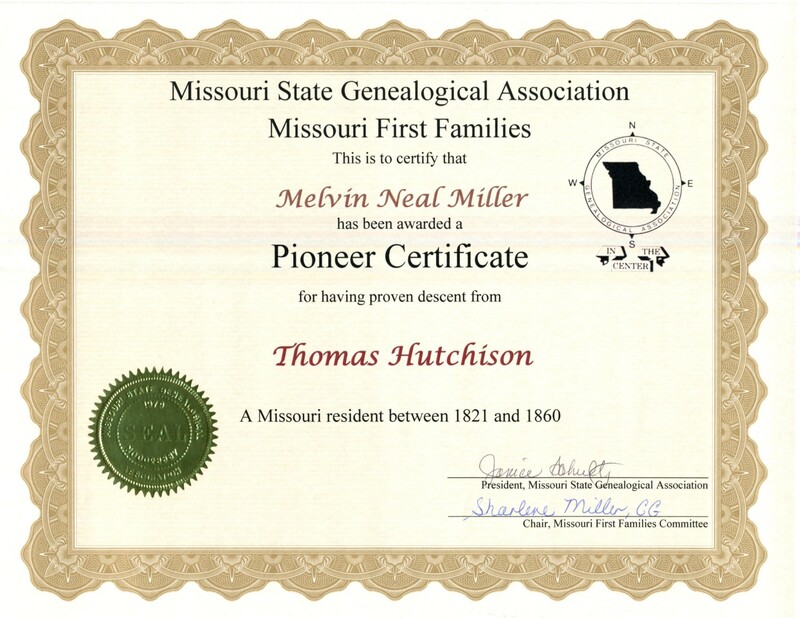 Documentation is required to prove residence of the Missouri First Families ancestor, relationship between each generation, and dates and locations of events. Photocopies of documents must accompany the application. Please send a transcription of the document if the photocopy is difficult to read. All documents must include a full citation. A copy of the title/cover page should be included, or the title, volume, author, publication date and page number must be written on the copy itself. Documents written in a foreign language must be accompanied by an English translation. Adoptions will be accepted, but must be designated as such. Use as many generations as needed to reach your Missouri First Families ancestor. To print a copy of the instructions click here. Please also include a completed application form for each certificate along with your supporting documentation. If you prefer to use a WORD document please use this link for a copy of the application. Elizabeth Shown Mills, Evidence Explained (Baltimore: Genealogical Publishing Company, Inc., 2007).